Natural ventilation is the process of letting fresh outdoor air into an indoor living space without the use of cooling systems or other kinds of mechanical devices. It refers to the process of replacing stale air with fresh air. This improves the indoor quality, stabilizes the temperature, replenishes oxygen, prevents moisture buildup, and gets rid of airborne pollutants and bacteria. In this post, we talk about natural ventilation, its benefits, and ways to improve it inside your home. Ventilation reduces pollutants in the air, including radon and formaldehyde. It regulates moisture and humidity levels, which prevents mold growth and possible structural damage. Moreover, ventilation reduces odors in your home that can come from smoking, pets, cooking, and other daily activities. When choosing replacement windows in Chesterfield, MO, consider casement windows. These will allow you to direct and control ventilation. Install operable windows in every room, so you can have easy access to fresh air. Consider roof windows or skylights for maximum ventilation. Direct breezes by integrating l andscape elements into your yard. 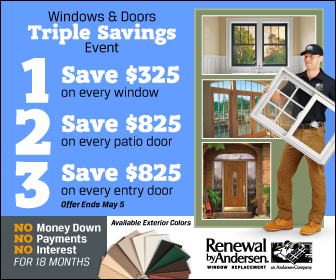 To fully improve the ventilation inside your home, get in touch with Renewal by Andersen ® of St. Louis. Our Chesterfield Missouri windows company, offers the widest selection of top-grade replacement windows. Increase the natural ventilation inside your home with beautiful, durable, and energy-efficient casement, bow and bay, picture, double-hung, or specialty windows. If you are unsure about the type of window to install in your home, we have an in-house team of expert designers to help you create the kind of unit that matches your needs, personality, and style. As our products are ENERGY STAR approved, you’ll enjoy reduced utility bills without compromising the beauty of your home. Start the path towards a healthier, well-ventilated home today. Call us at (314) 332-2364 or fill out our form to get a free quote.